“Sung scholars were serious connoisseurs of the implements of the studio – brush, paper, ink, and inkstone – treasuring those of exquisite quality. Commoners in the cities took pleasure in such aspects of daily life as making offerings of incense, testing tea, arranging flowers, and viewing plantings. In an effort ti satisfy popular demand, craftsman took care to their creations a meaningful and lasting appeal. Enhanced by their imagination, mirrors, pillows, flower vases, incense burners tea wares, wine vessels, and other objects of daily life were all of an exquisite and elegant nature. 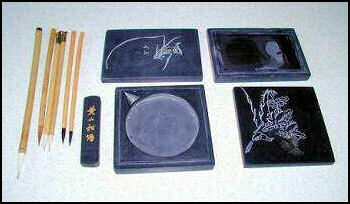 Examples of this in the collection at the Palace Museum in Taipei include: a pillow in the shape of a recumbent child with white glaze ( Porcelain, Ting ware, Northern Sung dynasty, ca., 11th-12th centuries) and Inkstone with landscape of the "Orchid Pavilion" (T'ao River stone, Sung to early Ming dynasty, ca. 10 th -14 th centuries). Song Dynasty paintings and calligraphy in the National Palace Museum, Taipei collection include: 1) "Sitting Alone by a Stream" (Fan K'uan); 2) "Monkey and Cats" (I Yuan-chi); 3) "Buildings on a Mountainside" (Hsiao Chao); 4) "Children at Play in an Autumn Garden" (Su Han-ch'en); 5) "Banquet by Lantern Light" (Ma Yuan); 6) "Lady Wen-chi's Return to China" (Ch'en Chu-chung); 7) "Squirrel on a Peach Branch" (Ch'ien Hsuan); 8) "Scroll of Buddhist Images" (Chang Sheng-wen, Ta-li Kingdom [Sung Period]); 9) "The Ladies' Book of Filial Piety" (Kao-tsung and Ma Ho-chih); 10) "Pavilions Amid Winter Trees" (Anonymous); 11) "Green Bamboo and Feathered Guests" (Anonymous); Calligraphy; 12) "Poem" (Hui-tsung). The artists of many of the great masterpieces of Chinese are unknown. Among the great Song era painters who are known are Zhang Zeduan, Gu Hongzhong, Fan Kuan, Ma Yuan; and Guo Xi. Song-era paintings in collection at National Palace Museum, Taipei include: 1) "Sitting Alone by a Stream" by Fan K'uan; 2) "Monkey and Cats" by I Yuan-chi; 3) "Buildings on a Mountainside" by Hsiao Chao; 4) "Children at Play in an Autumn Garden" by Su Han-ch'en; 5) "Banquet by Lantern Light" by Ma Yuan; 6) "Lady Wen-chi's Return to China" by Ch'en Chu-chung; 7) "Squirrel on a Peach Branch" by Ch'ien Hsuan; 8) "Scroll of Buddhist Images" by Chang Sheng-wen, Ta-li Kingdom [Sung Period]; 9) "The Ladies' Book of Filial Piety" by Kao-tsung and Ma Ho-chih; 10) "Pavilions Amid Winter Trees" by Anonymous; 11) "Green Bamboo and Feathered Guests" by Anonymous, Sung Dynasty. “The central section of a large hanging scroll illustrates the story of a loyal minister of the Han dynasty. At a court audience Zhu Yun inappropriately asked for the emperor's sword. Outraged, the emperor sentenced Zhu to death, but when his guards tried to drag Zhu away, he protested vehemently, grabbing onto the balustrade, and insisting that he be put to death immediately. One minister did not object, but another intervened to defend Qu's character and admonish the emperor. “Depictions of peace and prosperity also served the political needs of the court. Paintings like Zhang Zeduan's “Along the River During the Qingming Festival” or Li Song's Knickknack Peddlar could be read by emperors as evidence of the success or their governments. In the Song period the engagement of the elite with the arts led to extraordinary achievement in calligraphy and painting, especially landscape painting. But even more people were involved as connoisseurs. A large share of the informal social life of upper-class men was centered on these refined pastimes, as they gathered to compose or criticize poetry, to view each other’s treasures, or to patronize young talents. “The book depicts plum blossoms in eight stages, from the first bud to final withering, and each stage was also given a logical and interesting title according to the various aspects of the plum blossom, so that the drawings correspond to the titles in an entertaining fashion, for example: four branches of buds, sixteen branches of small blossoms, eight branches of large blossoms, eight branches of blossoming, fourteen branches of full blossoming, twenty-eight branches of magnificence, sixteen branches of wilting, and six branches of fruiting. Each depiction of plum blossom is also accompanied by a five-character quatrains. The Song Dynasty vernacular referred to portraits as "Xishen" (character resemblances), and Song Boren had therefore given the book the title Manual of Plum Blossom Painting. Guo Xi (ca. 1020 -ca. 1090) was a famous landscape painter and court painter. He once wrote: "wonderfully lofty are these heavenly mountains, inexhaustible in their mystery. In order to grasp their creations, one must love them utterly and never cease wandering among them, storing impressions one by one in the heart." One of his most famous paintings,“Early Spring,” dated 1072, is in the National Palace Museum, Taipei. “Old Trees, Level Distance” is Northern Song dynasty (960-1127) painting by Guo Xi. Dated to 1080, it is a handscroll; ink and color on silk (35.6 centimeters × 104.4 centimeters).According to the Metropolitan Museum of Art: Old Trees, Level Distance” compares closely in brushwork and forms to “Early Spring.” In both paintings, landscape forms simultaneously emerge from and recede into a dense moisture-laden atmosphere: rocks and distant mountains are suggested by outlines, texture strokes, and ink washes that run into one another to create an impression of wet blurry surfaces. 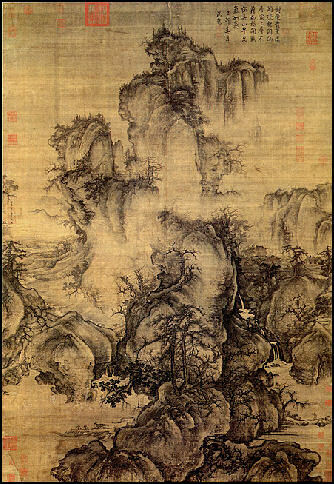 Guo Xi describes his technique in his painting treatise Linquan gaozhi (Lofty Ambitions in Forests and Streams): "After the outlines are made clear by dark ink strokes, use ink wash mixed with blue to retrace these outlines repeatedly so that, even if the ink outlines are clear, they appear always as if they had just come out of the mist and dew." "Along the River During the Qingming Festival"
“Along the River During the Qingming Festival” (also known as “Up the River During Qingming” and and “The Spring Festival Along the River”) is a handscroll painting by the Song dynasty artist Zhang Zeduan (1085–1145). It captures the daily life of people and the landscape of the capital, Bianjing, today's Kaifeng, from the Northern Song period. Patricia Buckley Ebrey of the University of Washington wrote: “ This painting is considered one of the most valuable in Chinese art history for its high level of technical quality and the liveliness with which it portrays the myriad details of urban life. It is generally interpreted as portraying the city environs of Kaifeng, the Northern Song capital, and some of the surrounding countryside.” The painting is considered to be the most renowned work among all Chinese paintings and it has been called "China's Mona Lisa." bridge in "Along the River During the Qingming Festival"
Content of "Along the River During the Qingming Festival"
boat about to crash in "Along the River During the Qingming Festival"
Copies of "Along the River During the Qingming Festival"
“Paintings in the style of "palace-covering flowers" were evidently made to decorate and adorn palaces and halls. In addition to their patterned compositions, fine brushwork and opulent colors are also their definitive characteristics. "Picture for the New Year" uses the painting technique of outlines filled with colors, whereby forms are first outlined and then filled with washes of color. The exquisite brushwork is made even more interesting through the use of some looser applications, allowing the brush to flow naturally. The addition of such bright colors as rouge, cinnabar red, pure white, malachite green, and azurite blue makes this opulent and majestic painting stand out even more. The scenery here can generally be divided into three levels, the first consisting of the slope, narcissi, slender rock, and bamboo in the foreground, the second for the garden rock in the center, and the third for the myriad blossoms and plants in the background. The auspicious color of red sets the tone here and presents a festive atmosphere to celebrate the Lunar New Year. The multi-petals of the red plum blossoms and the monthly rose feature pink hues of rouge washes on pure white pigment. The camellia blossoms are composed of brilliant red rouge washes on cinnabar red, and the red calyxes of the white plum blossoms are also done with a mix of vermilion. The red blossoms are set off by green leaves, which were done with an application of vegetable green combining gamboges and cyanine with an addition of mineral green washes to give them greater brightness. If the painting was only opulent, it might just seem to shimmer on the surface, but the use of ink and ochre for the garden rocks and slope creates a stabilizing force. National Palace Museum, Taipei description of the inscriptions on “Picture for the New Year” by Zhao Chang: “The sheet of paper mounted above the painting features an inscription by the Qianlong Emperor (1711-1799) of the Qing dynasty. In it, he mentions that the spatial arrangement and abruptly cut-off vegetation suggest that the painting was damaged in the past and then trimmed. Perhaps once having been larger, the work may have even been one in a series of screen paintings. In the lower right of the painting are two spurious "Servitor Chang" signatures done in different styles of calligraphy, evidently not by the same person. The lower one had apparently been previously hidden, which is probably why another was added, creating an interesting feature for this painting. On a handscroll, ink on silk (27.2 x 265.9 centimeters) by Emperor Hui-tsung, the National Palace Museum, Taipei says: “This particular work reveals his style of calligraphy known to later generations as "slender gold." Indeed, his brushwork was not only slender, but also so precise and refined that it looks as precious as gold. While many accounts concerning the origin of this style exist, it is known that Hui-tsung studied the regular script of such T'ang masters as Ch'u Sui-liang (596-658), Hsueh Chi (649-713), and Hsueh Yao and then imitated the late style of Huang T'ing-chien (1045-1105). The thin and tensile qualities which give the script its name are similar to the outer strokes painting orchid and bamboo leaves. In other words, the brush touches lightly and is retracted with force, producing knobby places at the turns. Consequently, despite the thin and stiff features, it has an even, light and elegant feeling. The structure appears balanced and refined and is visually and poetically pleasing. Although the calligraphy here appears strict and regulated, it is also free from many of the conventions of other calligraphic scripts. National Palace Museum, Taipei description of “Seven-character Truncated Verse” by Wu Ju. ca. 1145~50-1202~07) (hanging scroll, ink on silk, 98.6 x 55.3 centimeters): This is the earliest surviving work of calligraphy in the hanging scroll format, and it may have originally been part of a screen. The contents come from Cai Xiang's "Visiting Recluse Chen," the poetry reading, "Bridge-side weeping willows touch the blue stream; At the west end of North Bridge is the Gentleman's home. Upon arriving, it is unlike the world of people; The sun is warm, blossoms fragrant, and mountain birds chirping." There is some difference with the original poem, but the marvelous transcription of poetry here combines with a realm of ideals and remote distance. The character structure throughout is slanting and dense, the strokes being quite powerful. The spacing between the lines also echoes each other, much in the marvelous manner of Mi Fu's free and easy style. Wu Ju (style name Jufu, sobriquet Yunhe) was the son of Wu Yi, the younger brother of Gaozong's Empress Wu. His mother was the granddaughter of former Prime Minister Qin Kui. A master at calligraphy, Wu was later praised by Dong Qichang in the Ming dynasty as follows: "Among followers of Mi Fu's calligraphy, Wu Ju stands alone."